What's not to like about gratis flores? They brighten up a space, freshen things up, and might even help you get lucky. Same with Randy Flores. He brightens up the bullpen, could keep left-handed batters from stinking up the joint, and the Twins might even get lucky. That springtime hope is especially strong when you look at his numbers this year. He hasn’t given up many hits – just 22 in 27 innings, which is good. He strikes people out at a decent rate – about the major league average of six per nine innings. He’s given up four home runs, and that’s really only one more than you might like to see. The troubling part is the walks. He has walked players about 50% more than average, but control is something the Twins (and pitching coach Rick Anderson) are pretty good an instilling. Of all the faults he could have – and let’s be honest that freely acquired talent is gonna have faults – that’s the one you might choose. So why is he available? Because he doesn’t do what he was supposed to do – get left-handers out. Unfortunately, that’s also exactly what he is supposed to do with the Twins. This year, lefties are posting a higher OPS (776) than right-handers (702) against Flores. This isn’t just small sample size – that’s been the case over the last three years (852 vs 773) too. Whenever you see this argument made, be very wary of how many times pitchers have faced each side of the plate. For instance, you may have heard that left-handed batters hit left-handed pitcher Glen Perkins better than right-handed batters, and that’s been true, with southpaws hitting .325 vs. .287 that right-handed batters hit. However, there can be a good reason for this: mediocre and poor left-handed hitters aren’t allowed to face very good left-handed batters. Mediocre and poor right-handed batter are. So when a left-handed pitcher faces a left-handed batter, you can assume it’s a pretty darn good left-handed batter. Of course he hits better. That might be partly the case with Perkins. Perkins has faced three times as many right-handed batters as left-handed batters. In the normal course of games, he would probably face closer to twice as many, so it looks like he is facing a higher level of left-handed batter than right-handed batters. For Flores, on the other hand, the opposite is true. He has faced almost the same numbers of left-handed hitters as he has right-handed hitters. It’s almost as if National League managers have gone out of their way to let lefties bat against him. Not a good sign. Flores also seems to have become more hittable as the year goes on, and that also seems to be a trend over the last few years. But overall, those averages against him aren’t terrible. Plus, he hasn’t pitched in the American League since 2002, so there is a decent chance he could be effective until the AL adjusts. Finally, you never know how a left-hander who struggle with control might respond to Anderson – just look at the career years Dennys Reyes had here. The bottom line is that when someone offers you free Flores, you would be foolish not to accept. Just don’t expect them to last long. Enjoy whatever short bloom they give you, parlay that into some favor from Lady Luck, and be prepared for them to turn quickly. Your Saturday just got better. First, you know about the Sooz/TwinsCentric Party in St. Cloud on Saturday afternoon to watch the Twins beat up (knock, knock) the Rangers. We’ll be meeting at Howie’s from 2:30 to 6:30 with Seth, Me, Sooz and plenty of others. There will be specials and raffles including two Row 6 Twins tickets. I’ll see you there. And now we have a doubleheader. At 7:00 in St. Cloud at Joe Faber field, there is going to be a Twins Alumni Game, featuring Corey Koskie, Jim Eisenreich, Juan Berenguer, Jarvis Brown, Al Newman, Brian Raabe, Greg Thayer and even (Da-da-DUUUUH) Ron Davis. Oh, plus fireworks. You can find all the info here. This year, the Twins payroll increased almost 50% to $95 million. Next year, they’ll likely increase payroll again, and will need to given the payroll challenges they face. But how much will it go up? Can the Twins (and their fans) expect significant increases in revenues in the second and third years of a new ballpark? Is there any historical precedence for that? There is, but it’s far from universal, and the average increase is downright depressing. In this year’s Maple Street Press Twins Annual I wrote a comprehensive review of what other “small market” teams had done when they opened their new stadiums. 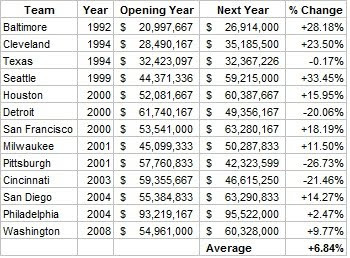 I identified 13 since Camden Yards opened in 1992 and looked at how they increase payroll and how the new stadium impacted their franchise. Today, let’s look at what happened the year after a new stadium opened (according to USAToday.com). Baltimore barely increased payroll as their new stadium opened. The revenues that poured in from Camden Yards remarkable success were more than people really expected, and lasted far longer than it had for previous stadiums. Cleveland was in the middle of a youth movement when Jacobs Field opened and that drove up salaries as those players gained service time. Seattle’s number is a bit misleading because they opened in the middle of 1999. Their first full year wasn’t until the next year, which is when revenue climbed 33%. But it isn’t crazy to suggest that the Twins could increase payroll by as much as 20% next year. It isn’t common for MLB teams, and it doesn’t look like teams generally see that kind of revenue bump in a stadium’s second year. But it has happened. Anyone want to talk about last night's game? No? Fine by me. Reminder: You're busy for Saturday's Twins Game. You'll be in St. Cloud, watching it with Seth, Sooz and I. 2:30 to 6:30 at Howie's in downtown St. Cloud and we'll have the usual specials and drawing. It's time for out-state Twins fans to flex their muscles a bit, I think. We talk a lot about “doing the little things”. So how about a statistic that recognizes the little contributions? I’ve talked a lot about WPA or Win Probability Added before in this space. The short explanation for WPA is that it measures how much a player increases or decreases the chances of his team winning a game. 3 stars – Michael Cuddyer – for delivering the clutch hit that put the game away. But looking at the WPA breakdown for last night’s game, I find out that I’m not quite right. Let’s see what I missed…..
1 star – I’m going to get to that in a minute. Hang tight. I’m right in that the three-run double was the big hit of the night. It improved the Twins chances of winning the game by 20%, up to 90%, and that was even with the baserunning gaffe (which may not have really been a gaffe, but a ploy to make the 3rd run scored, according to Cuddy). But Cuddy didn’t do quite as well in other at-bats. Well, I just feel stupid about this one. Baker holds a shutout for five innings in a tie game, and then two more innings afterwards, and I don’t list him as the 3 star player of the game? Brain cramp. My only excuse is that I’m a little down on Baker right now, and not completely objective. How down? Down enough that I was ready to turn to a complete stranger after Valencia’s dinger and predict that Baker would give up the lead in the next inning. And when it was 4-0 I was willing to bet even money that Baker gave up some runs with that lead. I just don’t trust him yet. Sorry, Scott. I’m glad you proved me wrong. Now, back to that one-star player. Who was more valuable this game than Valencia? 5th inning – he tripled to right (+2.8%) – How did I forget this? It was only one of the most exciting plays of the game. Boy, was the crowd pumped seeing him stretch that triple. It also set up the walks to Mauer and Jason Kubel and ultimately the big hit by Cuddyer, though WPA doesn't give any karmic credit for that. Two for three with a triple, a walk, and a run scored. Plus, a couple of other attempts that fell short through no fault of his own. Not a bad night for Hudson, and one that I might have overlooked if it wasn’t for WPA. I you’re looking for more TwinsCentric Twins notes, make sure to head over to Parker’s Over The Baggy blog where he talks about left-handed relief options that might be available. And if you want to talk some Twins, clear your calendar on Saturday. The next TwinsCentric (and Sooze) Viewing Party will head out of the Twin Cities Metro and up the road to St. Cloud. The lovely and talented Sooze is running the show on this one. On August 28th from 2:30-6:30 at Howie’s in downtown St. Cloud, there will be drink and appetizer specials as well as some give-aways. Those in the Metro, it’s not too far away, and those in the outstate, come on down! These events have been a lot of fun and a great opportunity to meet some of your favorite bloggers.